Heaven on earth. That’s where Sid Alpert lives. With a Hawaiian home located on a golf course overlooking the Maui coast and Pacific Ocean, Alpert lives in a lush tropical setting. 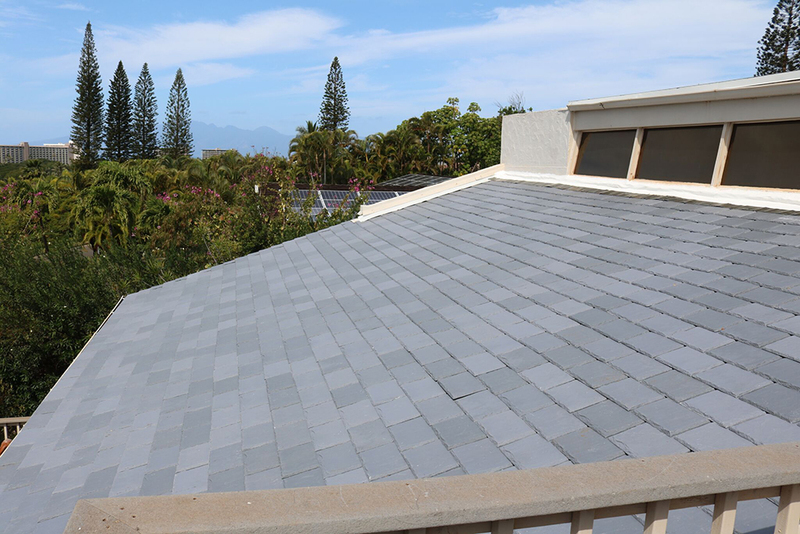 osite roofing tiles in Castle Gray from DaVinci Roofscapes. To enhance the energy-efficiency of his roof, he selected SOLARHIDETM as the underlayment for his environmentally-friendly roof. The SOLARHIDE one-step radiant barrier underlayment chosen by Alpert also serves as a vapor barrier. Available from DaVinci, a single layer of SOLARHIDE used in conjunction with DaVinci Shake, Slate and Bellaforté products can help the DaVinci roof attain a Class A fire rating. SOLARHIDE is produced with woven and non-woven fabrics as well as pure aluminum. The durable underlayment is 100 percent recyclable and exceeds Miami-Dade specifications. The rip-resistant SOLARHIDE product is now available from DaVinci Roofscapes in a 10 square roll (48 inches wide by 250 feet long) with 25 rolls per pallet.